Regular readers of this blog would have noticed that I blog occasionally about musical instruments and stuff relating to music. Are you a fan of Ed Sheeran? Want to own a guitar that's related to this talented artiste? Here's your chance to own an ed sheeran guitar available at Musicians Friend. Musicians Friend has a really extensive range of musical instruments and parts. But don't just take my word for it. 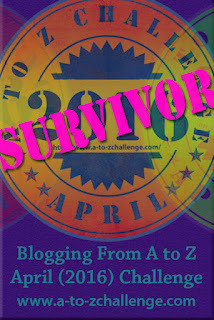 Check out the website. 1Malaysia Development Bhd Saga continues..
Recognise the gentleman in the picture? Never mind the lady though she's the newly-crowned Model of the Year. This post is about him. If 1MDB comes to mind, I'm not surpried. I read just now that The U.S. Is Preparing to Charge a Leading Figure in Malaysian Scandal. U.S. authorities intend to file criminal charges against a financier in connection with an international scandal rooted in Malaysia that they believe could be one of the largest financial frauds ever, according to people familiar with the matter. 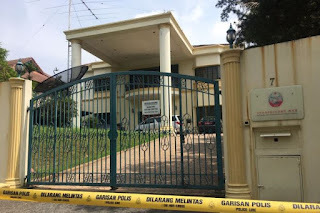 The scandal involves a state fund called 1Malaysia Development Bhd., or 1MDB, and the focus of the criminal investigation is Jho Low, a flamboyant financier the U.S. Justice Department portrayed in civil asset-seizure lawsuits last July as central to an alleged plot to siphon billions of dollars from the fund. Click the link above to continue reading.. Opening Google today brought up a surprise Google doodle. 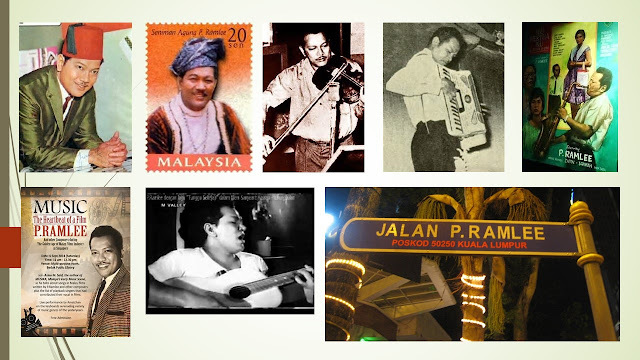 If P Ramlee is still alive today, March 22, he'd be 88 years old. 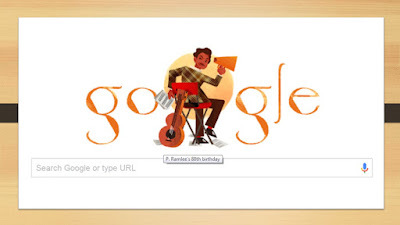 The Google doodle depicts a caricature of P. Ramlee sitting in the director's chair holding a megaphone and a music sheet. Beside him is a guitar. It symbolises his achievements in the Malaysian entertainment industry as an actor, director, singer, songwriter, composer and producer with more than 60 films and 250 songs to his credit. Tan Sri Datuk Amar Teuku Zakaria Teuku Nyak Putih (Jawi: تاوكو زكريا تاوكو ڽق ڤوتيه), commonly known as P. Ramlee (22 March 1929 – 29 May 1973) was a Malaysian film actor, director, singer, songwriter, composer, and producer. Due to his contributions to the movie and music industry and his literary work, which began with his acting debut in Singapore in 1948 to the height of his career then later moving to Malaysia in 1964 onwards to his death, he is regarded as a prominent icon of Malay entertainment; with his fame even reaching as far as Brunei and Sumatra, Indonesia as well as in Hong Kong and Japan. 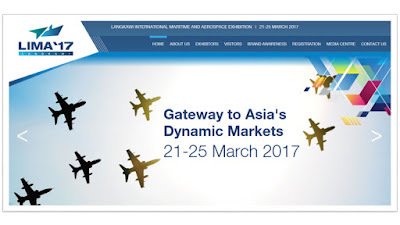 LIMA '17, that's what it is. 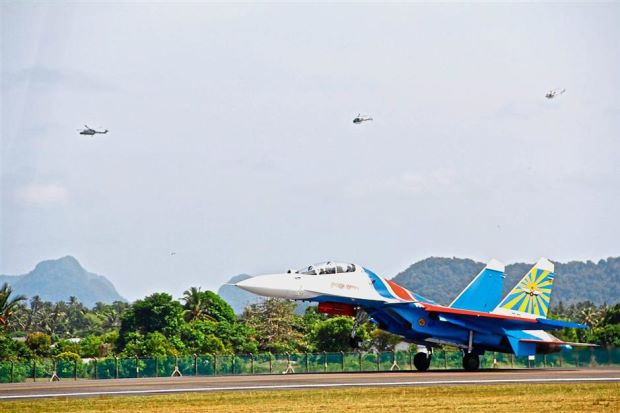 Aeroplanes and fighter jets worldwide are landing at the airport here and warships and vessels of all sizes are coming in to berth at Resorts World Langkawi (RWL). The 14th Langkawi International Maritime and Aerospace (Lima) 2017 is set to be bigger and better. This island is bustling with activities for the five-day biennial event which starts today, March 21 and will end on March 25. This video has gone viral. Nothing exciting about it for most of us but for those who work from home, you probably could relate to it. Professor Robert Kelly, during a BBC interview being broadcast live was interrupted by his two kids rushing into his room. His wife, yes, she's the Mrs, South Korean Jung-a Kim, hastily grabs the kids, dragging them out of the room and closing the door. Want a second watch? CNN's take on it. However, the episode was simply "hilarious" in the eyes of Prof Kelly's mother, Ellen Kelly, as she thought the young children probably thought their dad was Skyping their grandparents from their home in South Korea. "Life happens. The lesson is to lock the door," added the grandma. Yes, lock the door. But that's one cool Prof there. Air Asia in its first major promotion of the year is giving away up to three million promotional seats starting from March 13 to 19 for travel period from Sept 1, 2017 to June 5, 2018. Zero fares? You bet as fares will be as low as RM0 to destinations such as Ho Chi Minh City, Phnom Penh, Miri, Bangkok, Phuket, Jakarta and many more. The airline is constantly adding new places to connect travellers to new and exciting destinations, their latest being Luang Prabang, Laos; Bhubaneswar, India; and Honolulu, USA. However, if you wish to travel immediately, AirAsia has a special promotion for bookings during the same period for travel period from March 14 to Aug 31. AirAsia was named World's Best Low-Cost Airline eight years running while AirAsia X won the World's Best Low-Cost Premium Cabin and Premium Seat for the fourth straight year at the 2016 Skytrax World Airline Awards. AirAsia is Asia's leading and largest low-cost carrier by passengers carried, with a network of more than 120 destinations to Asean countries and other parts of Asia, Australia, New Zealand and the Middle East. Seems like it's hard to get out of this North Korea/Malaysia thingy. Unpredictable turn of events that keeps grabbing your attention especially when it happens here at home, in Kuala Lumpur, that is, and a video that went viral on how it was done in KLIA 2 to boot. The Malaysian Government has banned North Korean embassy staff and officers from leaving the country, says Datuk Seri Dr Ahmad Zahid Hamidi, Home Minister and Deputy PM. He also confirmed that the travel ban only applies to the diplomatic staff, and that regular North Korean citizens in Malaysia will be allowed to leave the country. Theirs is more drastic.. in that the ban covers ALL MALAYSIANS. SEOUL: Pyongyang is banning all Malaysian citizens from leaving North Korea, state media said Tuesday, potentially holding them hostage amid an increasingly heated diplomatic row over the killing of Kim Jong-Nam in Kuala Lumpur. And before this, North Korean retaliates by expelling Malaysian envoy after Malaysia expelled theirs. The Prime Minister has called for North Korea to release all Malaysian citizens immediately to avoid any further escalation of the diplomatic row between the two countries. The authorities are not monitoring the movement of North Korean citizens currently in the country, but action will be taken against them if they are involved in negative activities, said Datuk Seri Dr Ahmad Zahid Hamidi. 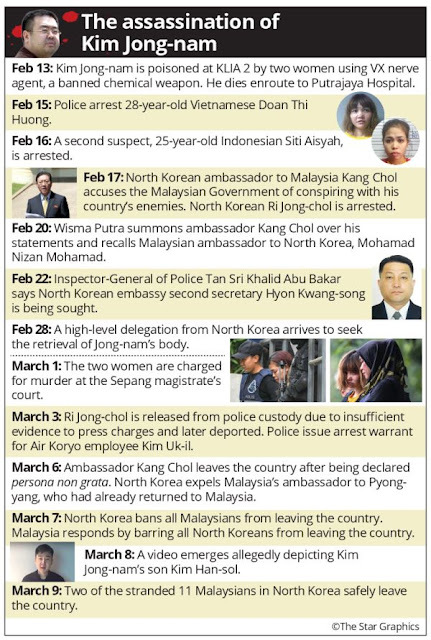 The Deputy Prime Minister said the latest records showed there were only 315 North Koreans still in the country, including those who were living here under the Malaysia MySecond Home programme. The rest, he said, were students or here for work. He said based on Immigration Department records, 2,453 North Koreans came to Malaysia between 2014 and this year with 801 issued temporary work permits. However, he said, many of them had returned home.